OLYMPIC VALLEY, Calif. – Six Peaks Grille at Resort at Squaw Creek is featuring a series of Dine Out nights, which will offer selected local charities a portion of the proceeds from that evening. 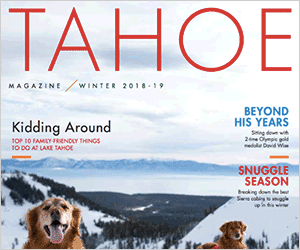 Thursday, Dec. 13, will benefit the Humane Society of Truckee-Tahoe and Friday, Dec. 14, will benefit Big Brothers Big Sisters of Nevada County and North Lake Tahoe.”We hope to see plenty of local faces at the Dine Out nights,” said Eric Sather, general manager of Resort at Squaw Creek. “It’s a great way to be able assist Humane Society of Truckee-Tahoe and Big Brothers Big Sisters, both of which make meaningful contributions to our community.”Six Peaks Grille gourmet dishes have been thoughtfully created by Chef de Cuisine Chad Shrewsbury and his team. Chef Shrewsbury has sustainable seafood from the Pacific waters, California raised beef, and organic, farm-fresh ingredients from the region’s rich soils. Ten percent of the proceeds From the Dine Out nights go to the selected charity. Additional Dine Out nights will be forthcoming in January. For reservations, call 530-581-6621.Dining hours will be 5-10 p.m. For more information visit http://www.visitsquawcreek.com.Humane Society of Truckee-TahoeThe Humane Society of Truckee-Tahoe is dedicated to saving and improving the lives of pets through adoptions, community spay/neuter services and humane education programs. For more information on any of these vital programs, please call HSTT at 530-587-5948.Big Brothers Big Sisters of Nevada County & North Lake TahoeBig Brothers Big Sisters of Nevada County & North Lake Tahoe makes a positive difference in the lives of children and youth in our region through a professionally-supported, one-to-one relationship with a caring and responsible individual. These individuals offer support to children’s growth and development through nurturing relationships, leading to positive outcomes. They are a dues-paying affiliate of Big Brothers Big Sisters of America, a nationally acclaimed organization with more than 100 years of successful experience in the youth mentoring field. Due to the success of existing matches, demand for programs has outpaced the capacity to serve new kids, resulting in a long waiting list of at-risk children needing and wanting a Big Brother or Big Sister mentor. Any additional revenues raised at this event will be used to make new matches in the Tahoe-Truckee region.